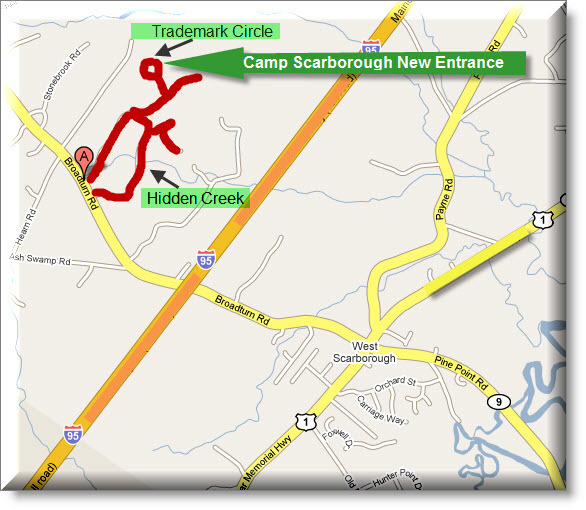 Camp Scarborough was founded in the 1950s by a small group of dedicated individuals who had a vision for establishing a local camping area for the Scouts of Scarborough. President Bob Dougherty and the Camp Scarborough Board of Directors invite you to attend the Rededication of Camp Scarborough, a celebration of years of work to achieve the goal of obtaining unrestricted access to this wonderful town resource. 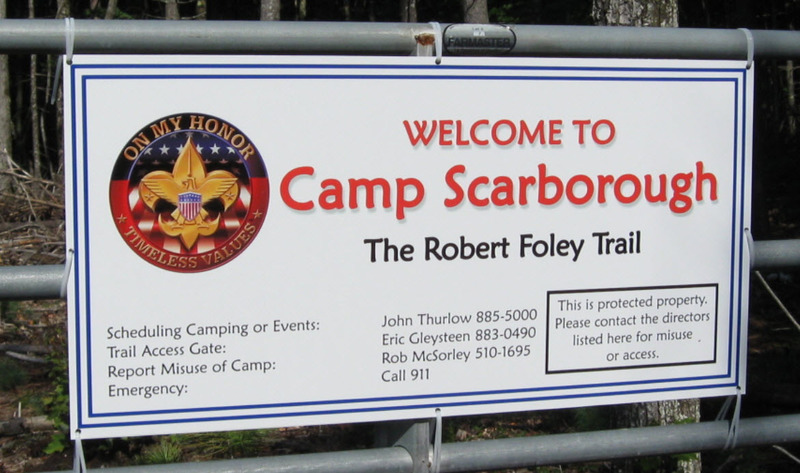 Camp Scarborough was founded in the 1950s by a small group of dedicated individuals who had a vision for establishing a local camping area for the Scouts of Scarborough. Over the past five decades Camp Scarborough fulfilled that vision and in its heyday was an incredible asset to Scouting in Scarborough. The challenge, however, has been to maintain and improve the property with a narrow walking trail and footbridge as the only access. Years of vandalism to the bridge and Adirondack shelters, and the inability to access the property for maintenance and improvements have naturally led to its decline in use by the Scouting troops and packs in our community. For the past five years the Camp Scarborough Board has been working with the Town administration and Town Council to find solutions to these problems. That solution was found when a local developer approached the Town with a proposed land exchange for property abutting the Camp and an access site was negotiated on our behalf. It’s taken a long time for the process to reach a conclusion, but it’s been worth it. 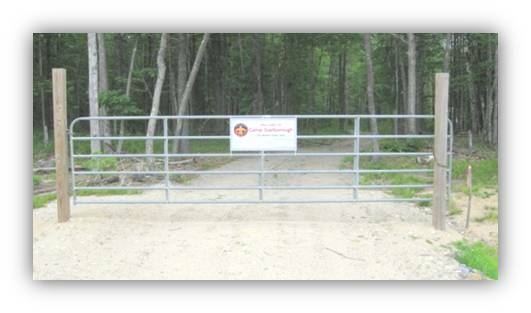 In the past year we have seen the construction of a dedicated access road and turnaround directly to the main part of the campsite, the installation of a security gate from the public road, and the ability to bring electrical power from the municipal system onto the site when it’s needed. Crews of volunteers have begun the process of repairing, cleaning, and restoring what can be restored and all of these efforts promise a renewal of the founders’ vision for a clean, safe, and natural setting for children and their leaders. There’s more work to be done and we hope that those who attend the Rededication will see the tremendous potential that this 25 acre site offers for the fantastic recreational experiences which Scouting has offered to generations of kids. And while Camp Scarborough is now surrounded by development, it can continue to remain a place of open space and natural beauty and benefit from more watchful eyes to look after it. Convenient access also offers younger children and their leaders opportunities to begin using it for its intended purposes which is to enjoy the outdoors, learn outdoor skills, develop an appreciation for the outdoors, and all of the other virtues which Scouting has promoted for over a century throughout the world. There are a great many people to thank for making this happen, from the original founders to the tremendous efforts of longtime president Bob Foley to the very active Scout leaders of the past who literally built this special place. We will try to recognize them all at the Rededication. The best way to acknowledge their contributions, however, will be the future efforts, beginning now, to bring this place back to life in a way which honors the hard work of those in the past and which will pay off in huge dividends as more and more young people enjoy the unique experiences that this type of recreation can offer for their personal development. Please join us at the campsite on Friday, September 26 at 5:30 for a brief rededication ceremony followed by plenty of time for reunion and for new people to get to know one another and share ideas and new visions. We recommend you bring a lawn chair, insect repellent, and perhaps a simple snack or appetizer to share. We look forward to seeing you there. With the helpof Berube Builders the unsafe Adirondack shelters were removed from the site. Built by the Army Corp of Engineers in the 1970's, these log shelters have been used by Scouts for forty years, but they have been in rough shape in recent years and the Board decided to accept Berube's offer to remove them. The plan is to not replace them but to maintain the large shelter as the only structure on the site. Camping can happen anywhere on our 26 acres in the natural forest setting. The Rededication of Camp Scarborough was held on September 26, 2008 in pouring rain and was attended by 30 or more Board members, Scouts and Scouters, invited guests and former members of the Troops. President Bob Dougherty presided and honored former President Robert C. Foley who flew in from Florida to be with us for the celebration. Bob cut the "ribbon" rededicating the Camp and the "Robert Foley" Trail was officially dedicated. Former Town Councilor and Camp Board Member Steve Ross attended and was recognized for his considerable contributions to the final resolution the Camp's access problems. The weather prevented many other people from attending, including Al Bell, one of the original founders, but certificates of appreciation will be presented to them at another time. Several Scouts from Troop 39 who were active in the 1980's attended with former ASMs Joel Pelletier, Bob and Jane Foley, Ed Minor, Arthur Price, and many others who are now active in the local troops and packs. Cathy Fitzgerald and Ed. O'Bar provided refreshments and Joel Pelletier had a wonderful cake made for the celebration. There was much talk about holding another event next year, perhaps a reunion of Scouts, Leaders and Board members during which we can recognize those who could not attend. Thank you to everyone who braved the weather and participated in this event. Camp Clean Up Day in Preparation for the Rededication. A huge "Thanks" to all the Board members, Scouters, Scouts and families who converged on Camp Scarborough on Saturday, September 13th for a major clean up in preparation for the rededication on September 26th. A special appreciation to Ken Rauschke and Sam Cushing for arranging the shredder, and to Town Councilor and Board member Richard Sullivan for bringing his tractor. Thanks to Ed O'Bar for a new flag, and to Dale Temm for bringing refreshments. And to all those not mentioned her, especially the Scouts who worked so hard, thank you for your tremendous effort!